Leonard Cohen wowed an adoring audience Thursday night, crooning his iconic ballads at his first show in Israel in 30 years and ignoring a political storm over his appearance. The 75-year-old singer entertained fans at Ramat Gan stadium near Tel Aviv for more than three hours. Some in the audience wore black fedora hats, a tribute to one of Cohen's trademarks. The concert sparked a protest long before it took place on a warm night near the Israeli seashore. Some Palestinian activists called for a boycott because of Israel's punishing invasion of Gaza, aimed at stopping daily rocket attacks. More than 1,150 Palestinians, including hundreds of civilians, were killed in the three-week offensive that ended in mid-January. Cohen responded by offering to perform in the West Bank city of Ramallah as well. He said all proceeds from the shows would go to Israeli-Palestinian peace organizations. But a pro-Palestinian group called "Academic and Cultural Boycott of Israel" urged the singer to cancel the shows and launched a protest campaign. "There are a lot of people who don't want us here, and anything done here invites controversy," Cohen's manager, Robert Kory, told The Associated Press. "But we believe freedom of speech is very, very important." Kory said the singer established a foundation, "The Fund for Reconciliation, Tolerance and Peace," to distribute proceeds from the concert. At an event launching the foundation before the concert, Israeli novelist David Grossman, whose son was killed in Israel's 2006 war in Lebanon, said he hoped for peace between Israel and the Palestinians. "We are here today to show that with a joint effort, we can redeem each other from this hate," he said. "Cohen wants the money to go toward changing hearts and to bring peace," Kory said. He said most of the money will go to the Parents Circle, a joint Israeli-Palestinian group of bereaved parents that helps families from both sides who lost loved ones in the conflict. During the concert, Cohen praised the Parents Circle several times. Palestinian members of the group were seen in the audience. Top international musicians are slowly returning to perform in Israel after years of staying away due to violence and political tensions. Madonna, Depeche Mode, Faith No More, and others have appeared this year. The 47,000 tickets for Cohen's concert were snatched up within hours when they went on sale earlier this month. Prices ranged from $90 to $315. 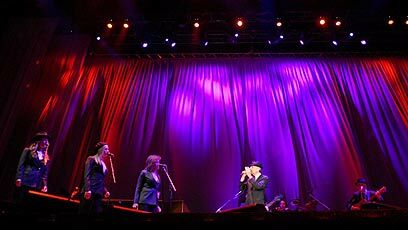 Cohen performed Thursday night meticulously dressed in a tailored suit and hat, clutching the microphone as he sang but showing no apparent affects from an incident last week, when he fainted during a concert in Spain. The Canadian songwriter, best known for his dark poetic lyrics, has been making music since the late 60s. He was inducted into the Rock and Roll Hall of Fame last year. He has been on a worldwide tour since May 2008, and earlier this year played in Australia and Europe. After Israel, he goes on to perform at US venues. Cohen had to come out of retirement five years ago when he discovered that most of his retirement fund had disappeared in a disputed case of mismanagement while he spent time at a Buddhist monastery. He last performed in Israel in 1975. Before that, Cohen entertained Israeli troops during the Mideast war in 1973. See all talkbacks "Leonard Cohen performs in Israel, defies boycott"